Released: 1991. Genre: 2D Platformer; Adventure. Other versions: SMD; SMS; GG; AMI; PC. On the back of a triumphant run of titles on the home computer systems of the UK, the Oliver Twins were keen to extend the series onto the console market. 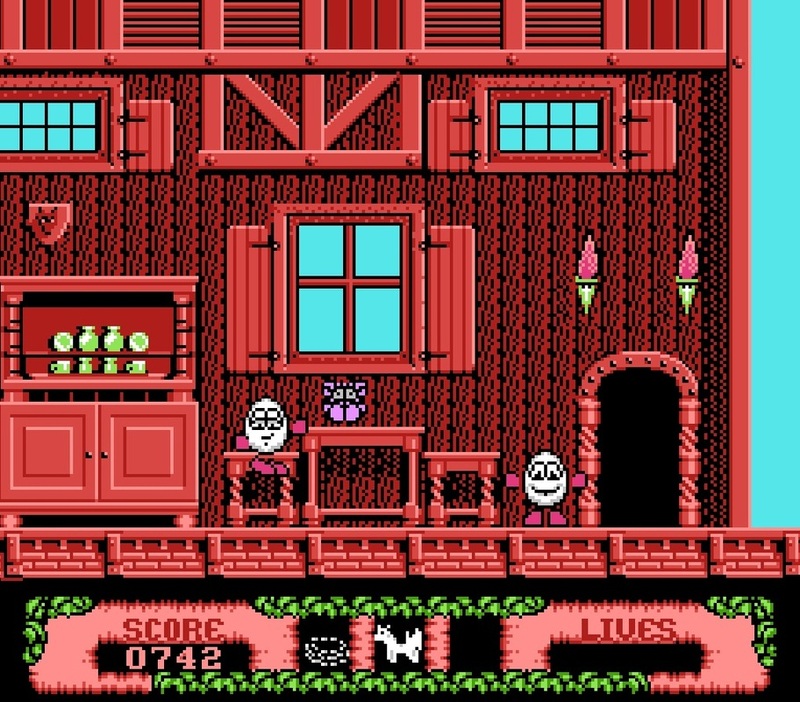 The seventh Dizzy adventure latched onto the massive popularity of the Nintendo Entertainment System. 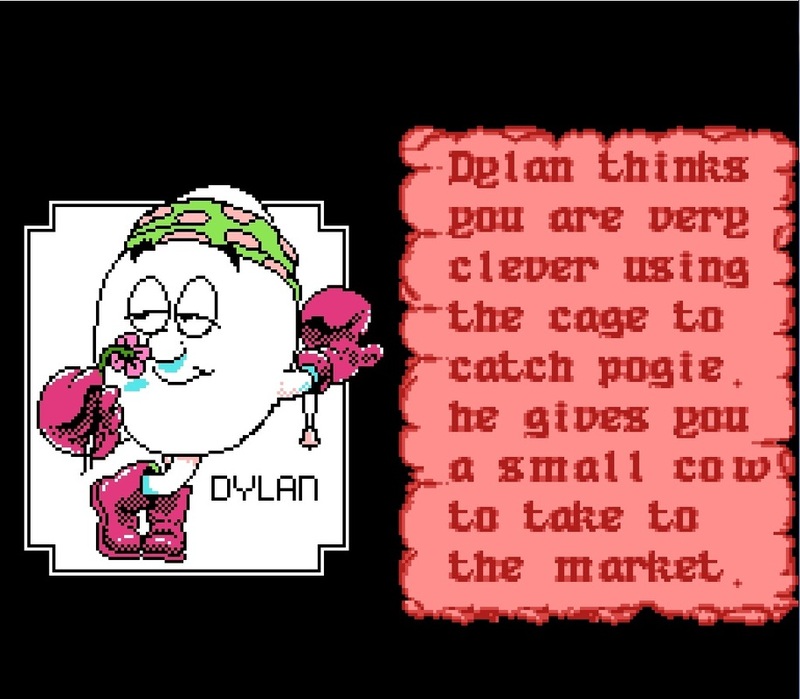 Spreading the yolky goodness further afield, Dizzy was to brave the American and Japanese markets with his biggest and most audacious quest yet. 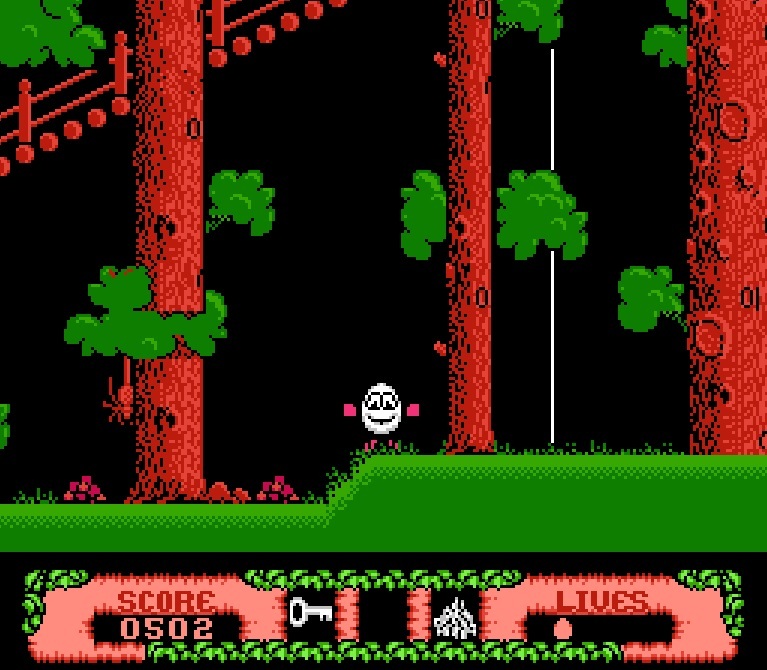 Featuring many elements from his previous outings with the additional sub-games included, could the NES do justice to the Dizzy series like the previous 8-bit platforms had done so before it? Two versions of this game were produced, one standalone cart and one for the failed Aladdin Deck Enhancer; this is a ‘gold’ cartridge-only edition. 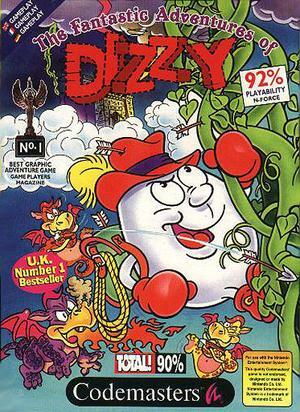 Now in full colour much like the 16-bit variations with a new, extensive world to explore, was this really the pinnacle of the Dizzy series that the Oliver’s hoped it would be? It procured accolades such as the ‘Parent's Choice Award’ and ‘NES Adventure Game of the Year’ shortly after its release, but what did us gamers and fans really feel about the world’s best selling console’s interpretation of Dizzy? We find our eggy protagonist and his yolkfolk chums in very familiar territory; that darn wizard Zaks has been up to his old tricks again and has kidnapped Dizzy’s squeeze Daisy yet again, and cast a few curses on his brethren for good measure. So it’s up to you and your trusty boxing gloves to explore the land, navigate your way through mazes, solve puzzles and help your friends, culminating in a showdown with the evil Zaks up in his cloud castle. Along your journey, Dizzy will bump into a few more familiar faces, such as Shamus the Leprechaun and Blackheart the Pirate. It would fair to say that Fantastic Dizzy is not entirely original compared to its forebears, as many of the plot lines, sequences and puzzles are lifted from the first three games in the series, or the separately released spin-offs. 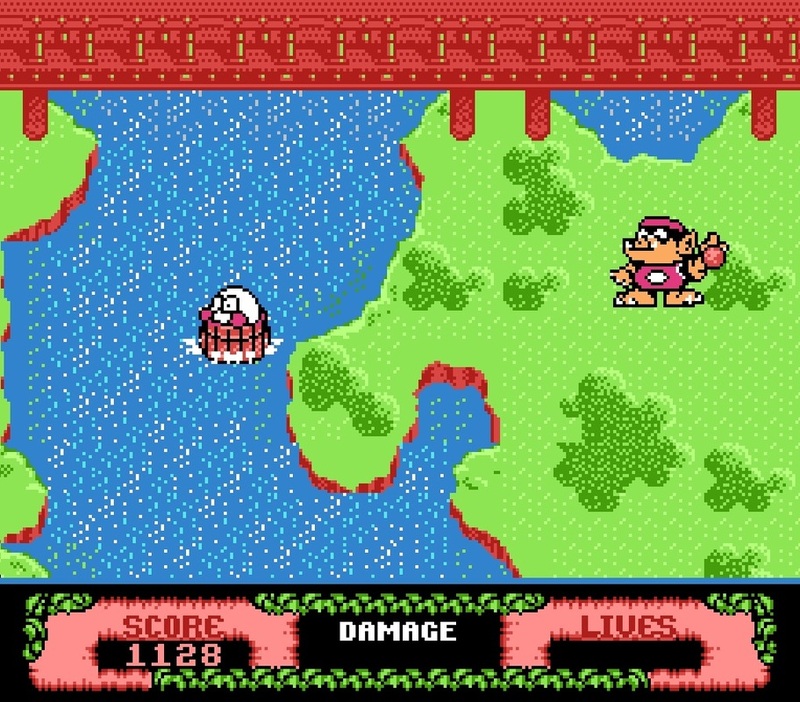 The inventory system, while not as basic as the first game reverts to the Treasure Island Dizzy arrangement, whereas a maximum of three items can be picked up and placed into a scrolling line for use. The better menu-based system of Fantasy World Dizzy and its sequels has been removed, but this does have the benefit of not slowing the progress of the game. The recognisable items utilised are altered slightly and there are variations to the patterns and implementation, but essentially if you have played all the games up to this the objectives are not a huge challenge. However, that’s not to say this is an easy game, far from it! The masses of hazards, paths to take, traps, and enemies on hand make saving Daisy a hard slog. Add to this Dizzy’s somersaulting predisposition and your skill to control this manic action to the utmost, and the side-quest of collecting all 100 stars scattered around the world, it’s a daunting task for any gamer. Dizzy’s hallmark presentation is apparent from the moment the slick and cheery title screen appears. With the colour palette taken from the brightest of cartoon network shows, we are immersed into a garish and gaudy world of primary pigments which, despite their natural tendency to clash, exhibit refinement, preciseness and are easy on the eye. The NES works some impressive graphics with Fantastic Dizzy, and certainly better looking than Super Mario Bros. or even Megaman for me. It’s brash with a distinctive quality much like its predecessors, the larger palette giving it more intensity and individuality. 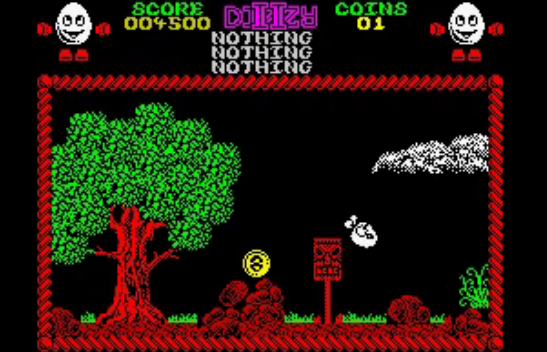 The Dizzy sprite is large and detailed, as are the many interactive parts of the scenery. While most of the enemies are drawn in single, base colours they are still well-defined and clear. Well, most of the time anyway. The odd tiny ant or rat can become camouflaged to the background on occasion, especially in the Graveyard and Keldor Village sections. Also, because of the amount happening on-screen some glitches do crop up. Some background layers, particularly the trees can look rather dubious with their cloned blocks not always positioned flush, the odd scan line can appear for a millisecond during jumps and when items are bunched together they flicker annoyingly. The overall high quality of the main game screen also isn’t replicated consistently in the mini-games. However, these small issues aside, Fantastic Dizzy is one of the finest looking games of the series, and marries well with the usual game mechanics on offer. This is important too, as much like the previous games, exact execution of the jumps and pixel-perfect positioning is a large factor contributing to the high difficulty. Dizzy games by their very nature are not easy titles by any means, you cannot breeze through them quickly and this is no exception. In fact, with the included mini-games and the control responses being a little over-enthusiastic, this is possibly one of the most challenging games to star the illustrious chicken ovulation. From the very start in the treetop village, it becomes apparent that the challenge is present the moment you start exploring. Enemies and pitfalls await at any given moment, some utterly relentless and often highly difficult to avoid or anticipate. 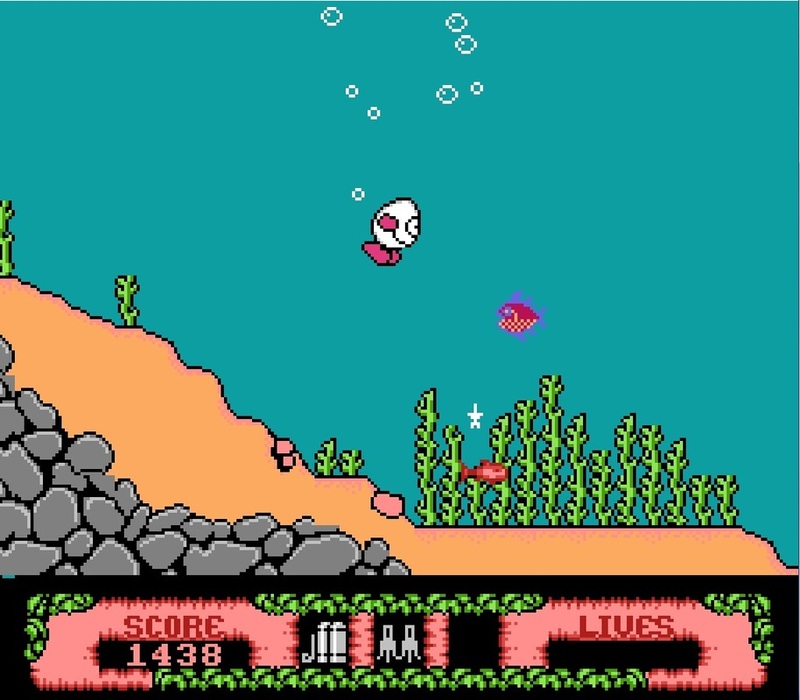 A few facets to this version are helpful to the cause; the flick-screen style is now limited to changes of scene or vertical height, in a departure from the normal there is some nice scrolling and depth to the environment, Dizzy can hide behind trees, enter doors or jump up through certain platforms. The inclusion of an energy bar system is also very welcome, much like Magicland Dizzy, with collectable fruits scattered around to replenish this. Few instant deaths occur like the previous titles it borrows from, but keeping as many lives intact to ascertain victory is a lesson you learn immediately. The mini-games disregard the energy bar and will remove a life should you fail. One of these games, the Mine Cart section has to be replayed at least twice in order to complete the game, and this part alone can wipe out your adventure in one fell swoop. This does lean towards the downright unfair, as there are no continue or save options, and dying at this point means you will have to play through half the game again. Repeating these mini-games can get frustrating so it’s good that the game in the main is very enjoyable; maintaining a mostly fair, high difficulty level. 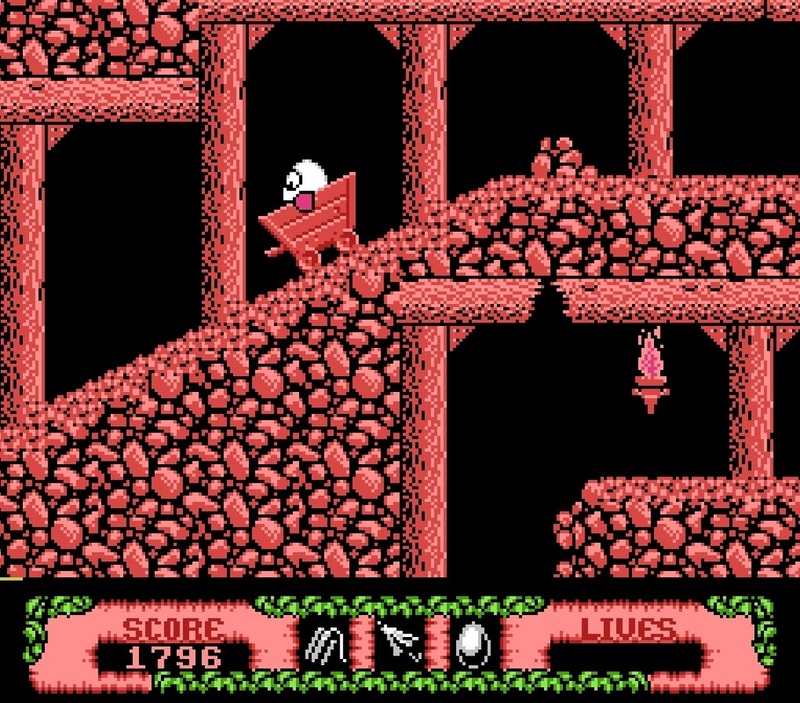 Early nineties platformer in "unfair mine cart section" shocker! No Dizzy game would be complete without an exceptionally catchy theme tune and in-game soundtrack, so this NES outing cuts no corners and goes mental with the amount of individual songs in the game. The title music is a bit of a cop-out; a re-arranged version of Treasure Island Dizzy’s title theme, but it’s still great and excellently produced. During gameplay, the production is fine but the tunes are hit and miss. Some are lovely, jolly japes merging with the action with ease, but some tunes are grating and nauseating after the first few bars, to many are backed by burbling tones or far too highly pitched notes. Why so many different tunes are put in is beyond me as this as not required, but I must at least commend the effort put in. Thankfully, the most frequent BGM is typically entertaining Dizzy stuff, and the SFX are spot on; just the right amount, and at just the right moments. The Fantastic Adventures of Dizzy is probably the most comprehensive of the Dizzy titles, encompassing plenty of the key material so synonymous with the franchise, with the NES proving an excellent platform to exhibit such a game. It avoids the repetitiveness and ridiculous length of Spellbound Dizzy, but extends the adventure beyond the likes of the previous titles it has evolved from. 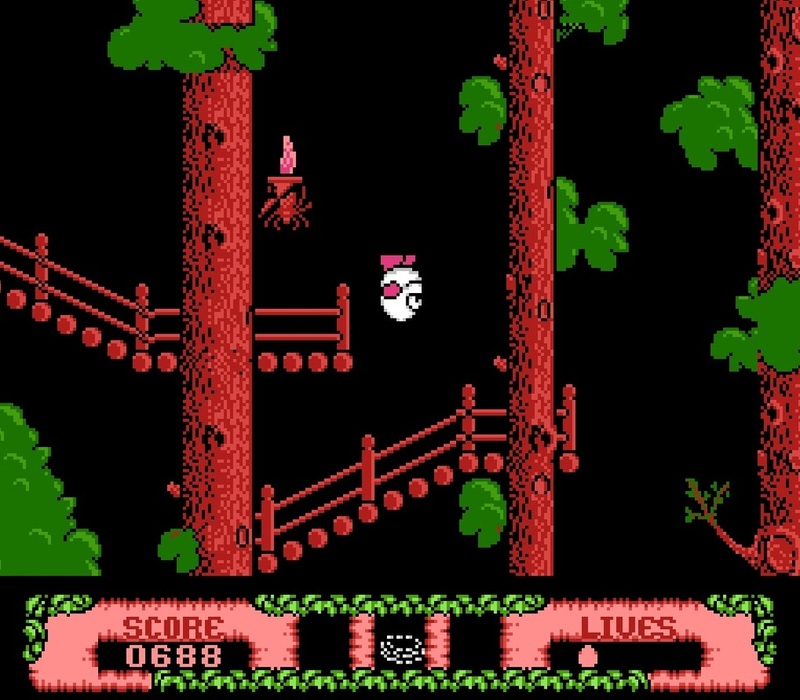 With a slight tweaking to the control system, a little less musical noise and a few adjustments to the unfairness of the mini-games, this would have been the outright big-egg of the Dizzy universe. An extremely enjoyable, carefully crafted and fine title all the same, and as tough to crack as a hard-boiled Faberge egg.